The leader of the 'Five Sacred Mountains', Mt. Taishan is located in the center of Shandong Province, lying across the cities of Tai'an, Jinan and Zibo. 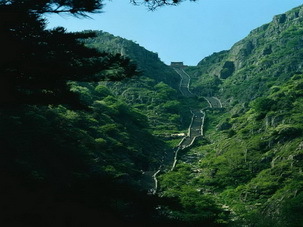 Its main peak, Jade Emperor Summit, which is within Tai'an City, is about 1533 meters (5,030 feet) high. 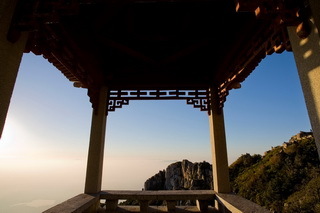 Mount Tai is well known for its grandness and the south part is especially steep and spectacular. The typical character of natural scenery of Mount Tai is imposing, steep, surprising, serene, secluded, profound, and spacious. 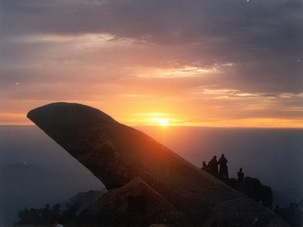 The sunrise in Taishan Mountain is one of the marvelous natural phenomenon on top of the mountain and also an important symbol of Mount Tai. Standing on the mountain in the misty early morning and evening, you can see a colorful ring with blue inside and red outside, called "Holy Light". Taishan Mountain is also famous for its diversified stone inscriptions, which were either inscribed by ancient emperors or celebrities. Most of the inscriptions are inscribed with elegant font style, beautiful words and delicate design. In total, there are 1696 stone inscriptions in Mount Tai area, mainly divided into two kinds: inscriptions on precipices and inscriptions on steles. 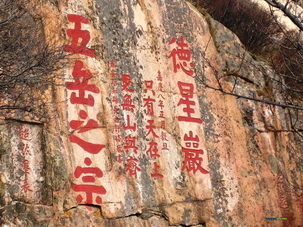 All of these stone inscriptions are precious records of the history of Taishan Mountain. Ancient rulers and common people usually paid homage to the mountain, in the hope of bringing blessing and good luck.